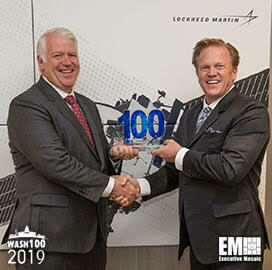 Jim Garrettson, founder and CEO of Executive Mosaic, presented Rick Ambrose, executive vice president of space systems for Lockheed Martin, with his fourth Wash100 Award on Monday. Executive Mosaic recognizes Ambrose for leading the improvement of space technologies, including use of the cloud for space missions. We are pleased to present the most coveted award in government contracting to Ambrose. Ambrose joined Lockheed Martin as the vice president and general manager of surveillance and navigation systems in 2006. He served in the role for four years before becoming president of information services and global solutions between 2011 and 2012. Ambrose then served as vice president and deputy of space systems for another year before assuming his current role in 2013. In addition, Ambrose has served as the chair of the board of directors for the United Launch Alliance since 2013. He is a member of the board of trustees for the Denver Museum of Nature and Science, a former board chairman of Sandia National Laboratories and a former board member of the Space Foundation. 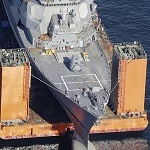 He received the National Defense Industrial Association Space Division Peter B. Teets Award in 2017. Ambrose is a fellow of the National Association of Corporate Directors Governance, the American Institute of Aeronautics and Astronautics and a full academician of the International Academy of Astronautics. Ambrose received a bachelor’s degree in electrical engineering technology from the DeVry Institute of Technology and an MBA in business administration from the University of Denver – Daniels College of Business.